After registering for the Marathon, I decided to eat healthy but cornflakes or plain oats aren’t my kind of food. I’ll go for poha, idli, upma any day (Of course they need to be prepared nicely not the hostel-food kind). 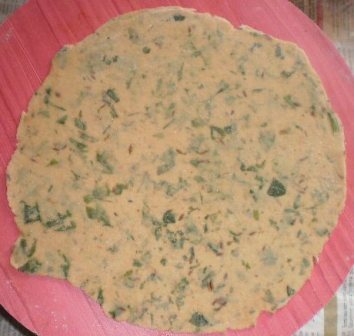 So I started looking for other options and that reminded me of bajra rotis which are usually prepared around Sankranti time. 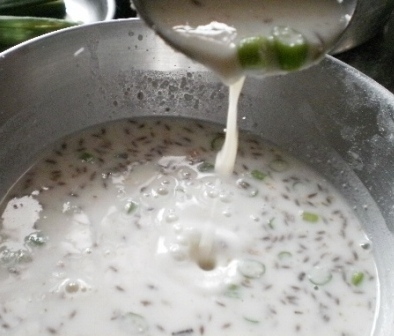 They are an awesome food esp during winters. One thing I totally love about the healthy food fads is millets are back in style. 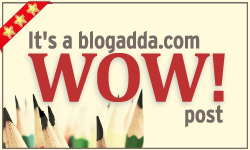 Bajra/Pearl millet/ಸಜ್ಜೆ is one of them. It is a gluten -free grain and comes with a plenty of other benefits. 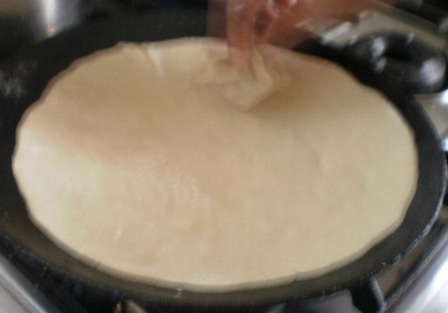 Here is how to make some tasty rotis. 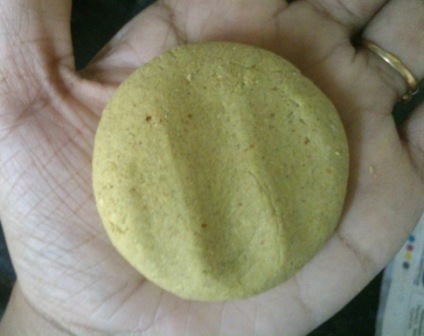 They are made the same way as Jowar/Sorghum rotis. 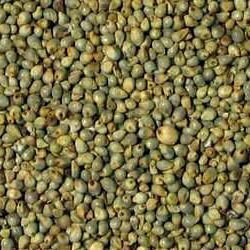 For better pictures and a more detailed recipe check this out and just replace jowar with bajra. 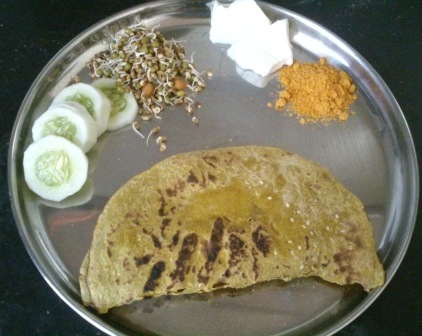 In this recipe, I have added some jowar with bajra and also some more spices to make the roti tastier. Don’t put all the water at once. Keep adding a little every time. Also, use a spoon to mix the water as it is very hot. 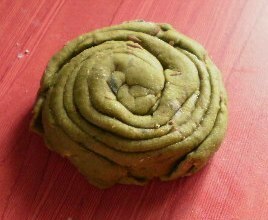 Once rolled out, put it on hot tawa. Make sure the tawa is hot for good rotis. In the next few seconds, as the roti gets a little dry, use a clean muslin cloth and apply a thin layer of water on the upper surface. Let it remain till water evaporates a little and flip it over and press slightly with a soft cloth to make sure it is done properly on all sides. You can eat it with any subzi, but I can’t wait these rotis so I am eating it right away with cucumber slices, sprouts, channa dal/ಪುಟಾಣಿ chutney and awesome curd. 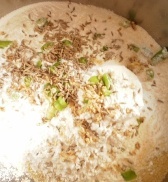 In a mixing bowl, mix rava, rice flour, maida, chopped green chillies, cumin seeds, ginger, hing and salt. Then add water to this dry mixture. The consistency should be that of buttermilk. I tried getting a pic not sure if you can make out from the pic. 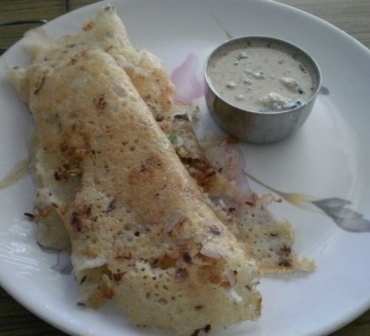 You cannot spread this dosa batter with a ladle like the other dosas because the batter is very thin. 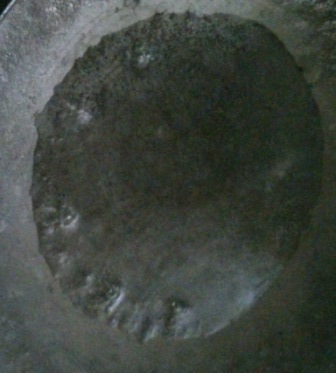 You need to pour the batter and swirl the tawa or sprinkle the batter starting from outside and finishing in the centre and filling the gaps later. 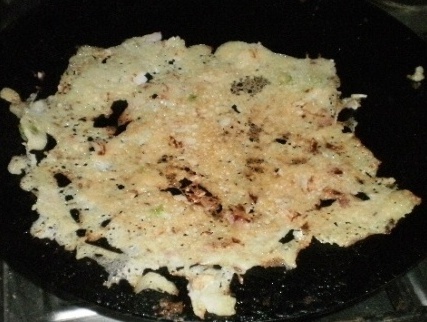 In this pic I have sprinkled the dosa but the gaps need to be filled. 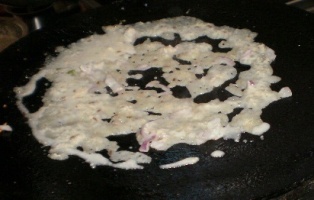 Now put some more oil on the dosa. Keep the tawa on high heat and remember this one takes a little more time than your normal dosa. 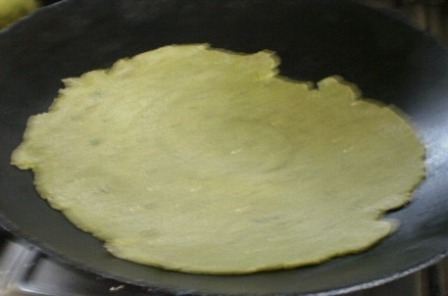 Once you see the dosa getting brown on the bottom side, flip it with a spatula. Anyway if it doesn’t come out properly, don’t despair. For the next one pray to your favorite god and start again from cleaning your tawa, adding some oil and sprinkling some onions on it. 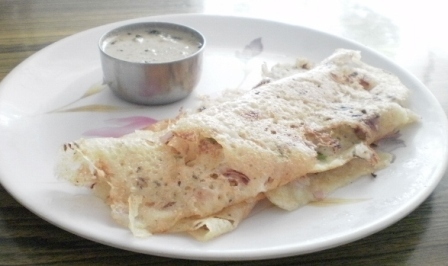 Keep repeating the above steps till you get a nice, brown, crispy dosa. You will get it soon. It ain’t no rocket science! And once done, take it out on a plate and eat it hot with any of the dosa accompaniments. 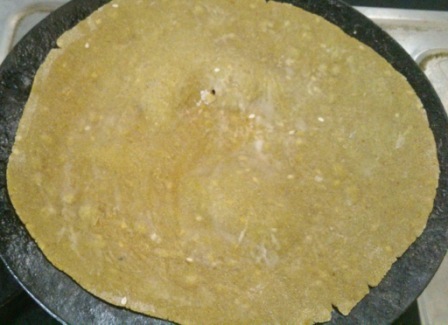 Rava Dosa – ready to eat. 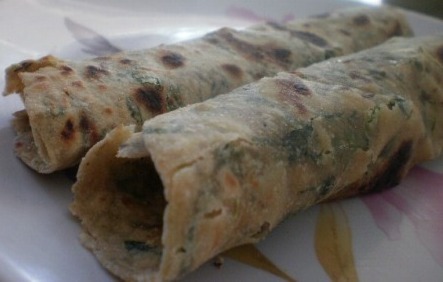 Methi Paratha and Palak Paratha are favorites at home. But I had not tried a combination before. I got this recipe for vinicooksveg and folks at home loved it. 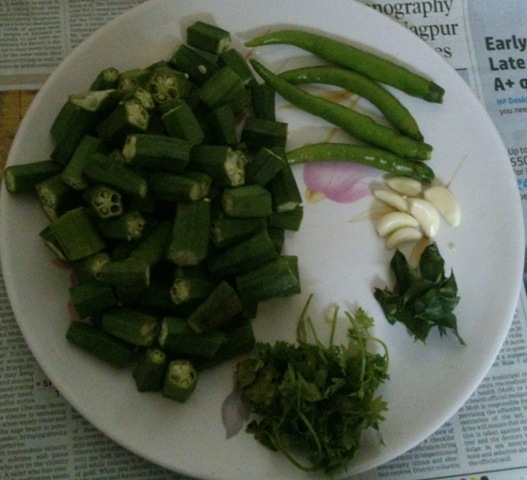 Only I did not add Fennel seeds and lemon juice and also decreased the quantity of coriander leaves. She has used yoghurt to knead the dough but I just added about 3 tbsp of yoghurt and used water to knead the dough. I don’t think she used hing, you can skip it too but at my place nothing can be prepared without hing. Again this is tasty, healthy and easy to make and a great breakfast option. 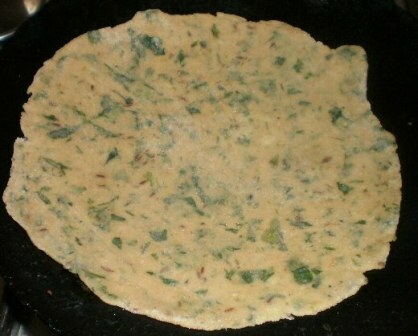 Oil – 2 tsp to knead the dough, 2 tsp for green leaves & the rest to fry the parathas. 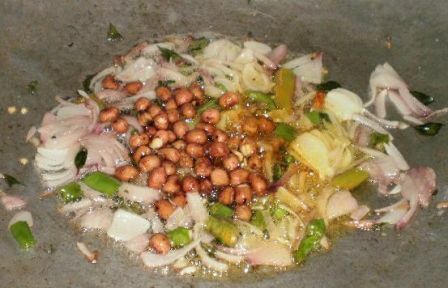 Heat oil in a pan and add the cumin seeds to it. 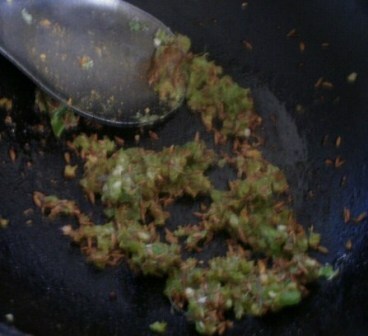 As the seeds splutter, add hing and the green chilli paste and sauté for a minute. Now add the chopped greens. Saute for a minute and add the coriander powder and garam masala powder. Saute for another two minutes. Remove from the heat and let it cool. 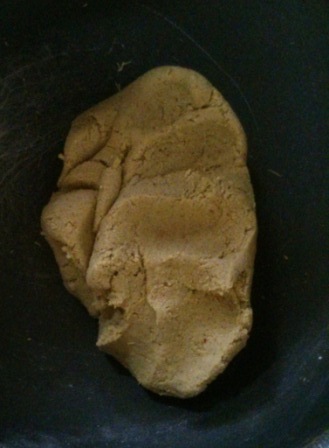 Now to the wheat flour add the chick pea flour, salt, yoghurt and greens mix. 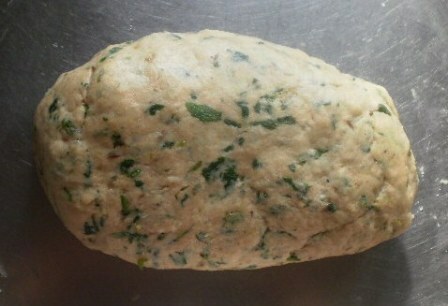 Knead the dough and let it rest for 20-25 mins. 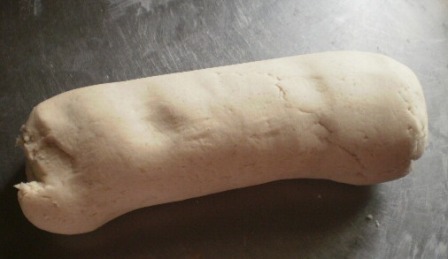 Take a ball sized dough and roll it out using a rolling-pin. 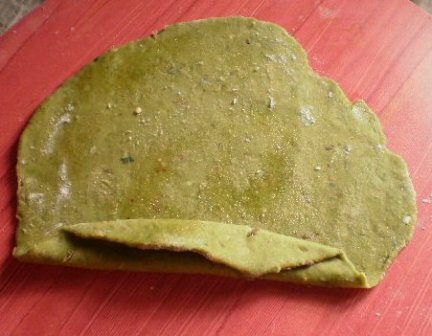 You can use any of the folding methods to fold the paratha. I made a triangle and rolled them out. Put it on a hot tawa and fry the paratha from both sides. Once fried, serve it hot with any of the paratha accompaniments. We had it the North Karnataka style. 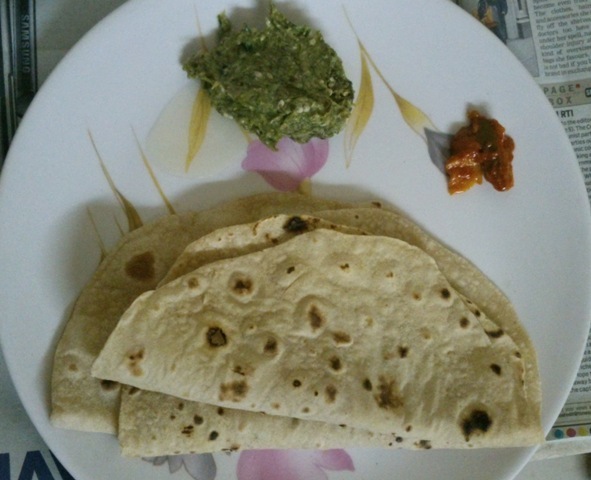 Add ತುಪ್ಪ(ghee) and ಪುಟಾಣಿ ಹಿಂಡಿ/ಚಟ್ನೀ( chutney), roll the paratha and gobble it up. The first time I thought of this dish was on the Irish festival Saint Patrick’s day. To say that we don’t celebrate it here even would mean that people know of this. But my Facebook wall was flooded with green pictures from my friends staying in North-America. Rivers colored green, people wearing green and even rivers dyed green. I wanted something green too. I couldn’t dye a river nearby but surely I could cook something green. Who better than Sanjeev Kapoor for a recipe. 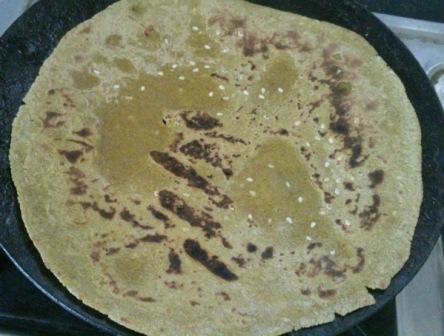 His recipe calls for only salt and ajwain but I have added a few more ingredients of my own to get a different taste in paratha. Hope you like it. Goes without saying, it is healthy, wholesome and green :P. I have paired it with green coconut chutney to suit the green theme. 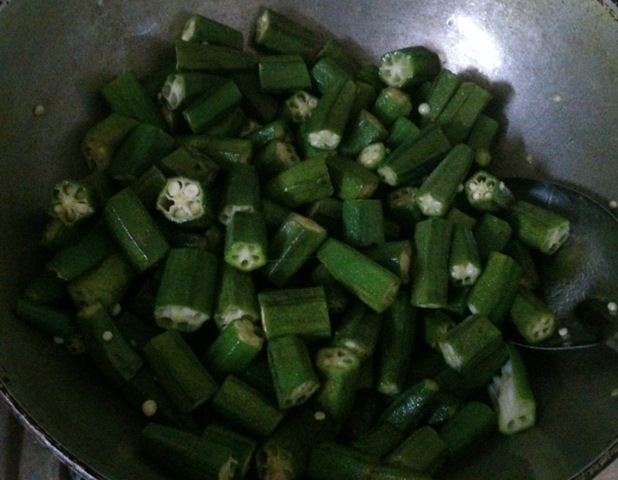 You can have it with pickles, sabzi, curds or just a thick layer of butter. 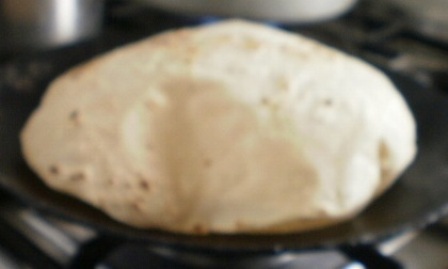 Also, the method used here for folding the parathas makes it a lachcha paratha. You can use any style you prefer. 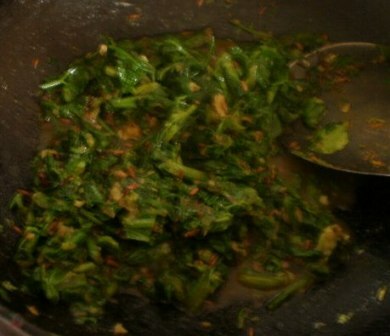 This requires you to make blanch the palak/spinach. Blanching enhances the color and the flavor of the spinach and also makes it soft. 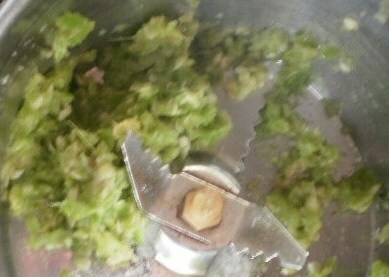 After blanching, grind and make a paste of the spinach. 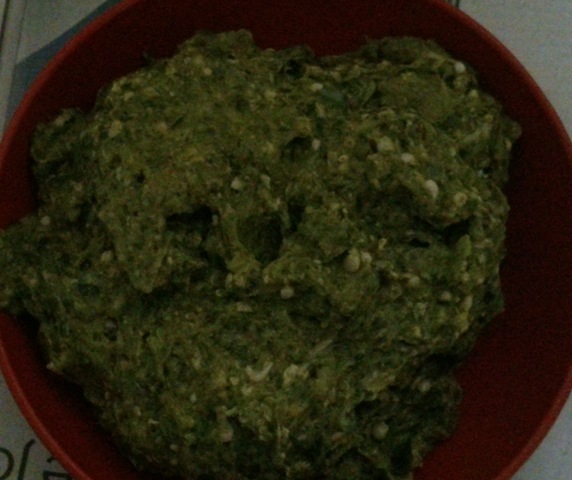 Blanch and grind the Spinach to make a paste. 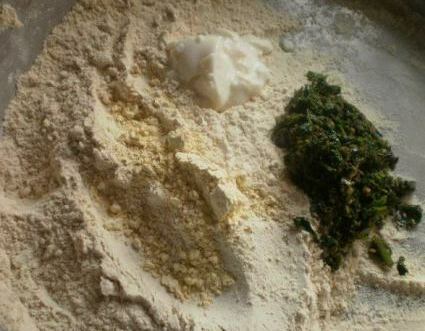 Add all the dry ingredients with the dough and mix them well. 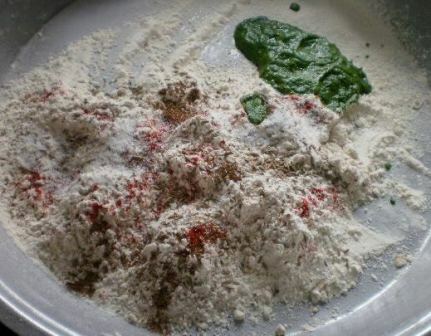 Later add the Spinach paste to it and mix. 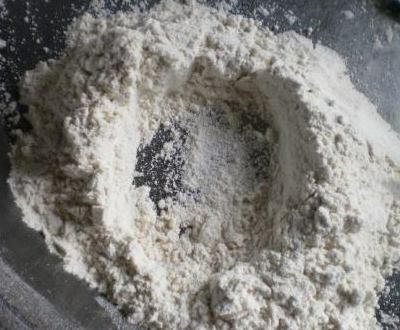 Use milk to knead the dough. And let it settle for 20-25 mins. 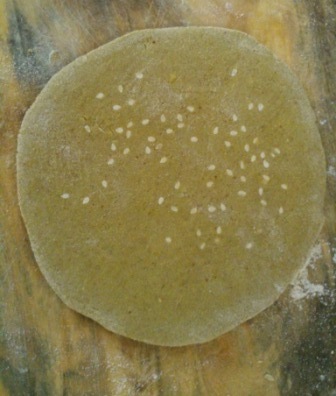 Once rolled out now sprinkle a bit of flour and oil on the paratha. 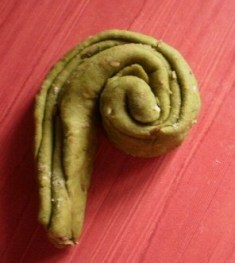 And start to fold it in the Japanese fan style. Then fold it to make it round. Sorry I couldn’t describe it any better. Please see the pics to get an idea. Put the paratha on a hot tawa. ವಗ್ಗರಣೆ ಅವಲಕ್ಕಿ/Avalakki/Poha/beaten rice/flaked rice is a very popular breakfast in North-Karnataka and my all time favorite. I can eat poha all most everyday. It is light, healthy, quick and tasty. 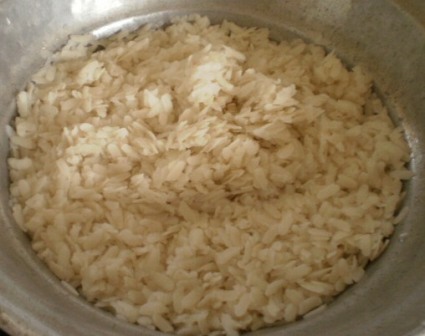 Beaten rice is available in three types here. Thin,Medium and Thick. For this recipe, you will need the medium variety. In case you don’t find it then you can use the thick variety only you will have to wash the poha a little longer. 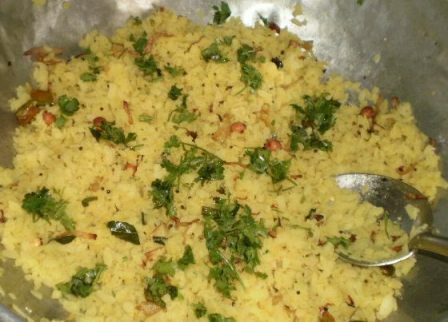 This particular recipe is also called kanda poha(kanda=onions). 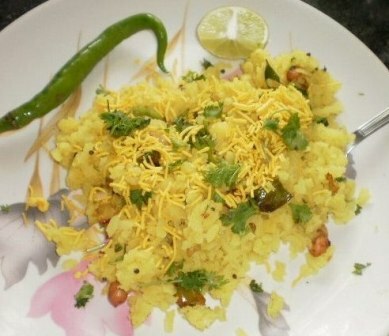 You can also prepare it with potato which is called aloo poha. You can add fresh seasonal ingredients like green peas, fresh green chickpeas. You can also add tomatoes but we prefer it without them. What I have given is the way it is usually prepared at my home. Wash the poha in a colander. Make sure it is soft and not mushy. Which is why we don’t take the thin variety for this. To this add sugar, salt and lime juice and mix lightly. Keep it aside. Once the mustard seeds splutter, add hing, curry leaves and sauté. If the peanuts are not roasted add them now. 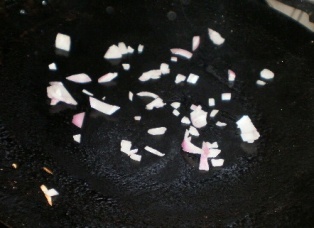 Add the onions and sauté for a minute. Now add green chillies and roasted peanuts, turmeric powder and sauté till the onions are done. Add the poha that was kept aside and mix well. 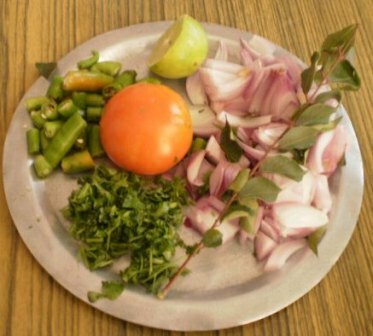 Garnish it with fresh coriander and serve it hot. 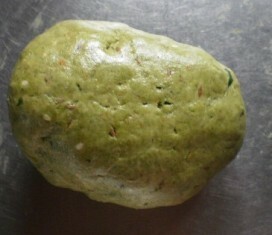 You can also have it some sev or potato chips or South Indian style with some green coconut chutney. Millets have been a part of Indian diet for thousands of years and the health benefits are well-known. If you didn’t here are a few benefits for you. Sorghum is rich in phytochemicals including tannins, phenolic acids and anthocyanins. Studies have shown that sorghum can reduce the risk of certain types of cancer in humans. The phytochemical levels are so high in this millet that they have shown potential usefulness in reducing obesity as well. 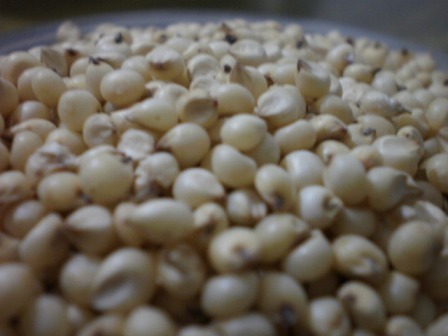 Apart from jowar/sorghum/ಜೋಳ, the other popular millets found in India include pearl millet(bajra)/ಸಜ್ಜಿ and ragi/ರಾಗಿ. There is also foxtail millet/ನವಣಿ which isn’t that popular but healthy nonetheless. 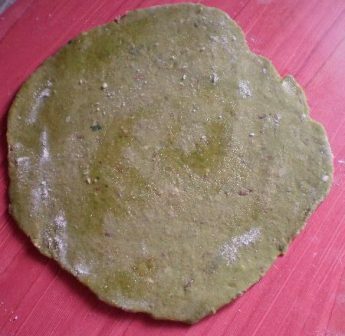 Jowar roti/ಜೋಳದ ರೊಟ್ಟಿ/ಬಿಳಿ ಜೋಳದ ರೊಟ್ಟಿ is a staple food in North-Karnataka and parts of Maharashtra. 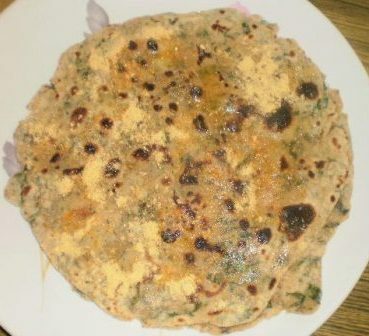 Jowar roti is unleavened flat bread made from jowar/sorghum. This doesn’t need any oil adding to the benefits above. It requires some skill( a little more than my skill level) to make soft and even rotis. So I happily clicked away while my Mom made them. In a small vessel take about 1/2 cup water and bring it to boil. Make sure the water is boiling and not just warm. Not sure if you can see the bubbles rising in the pic. Now add the hot water into the dough. Do not add all the water at once. 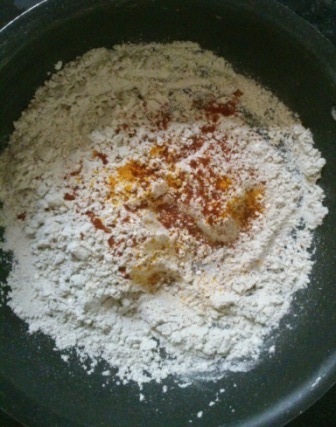 Add only about half and keep adding as you knead. 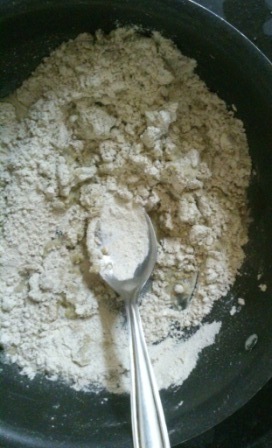 Also, use a spoon to mix the flour as you will be adding hot water. 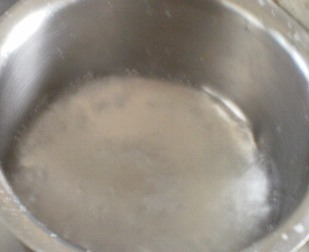 Hot water is required as there is no gluten in jowar. 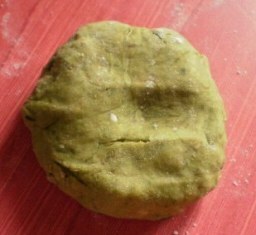 This is known as jigatu/ಜಿಗಟು in kannada. 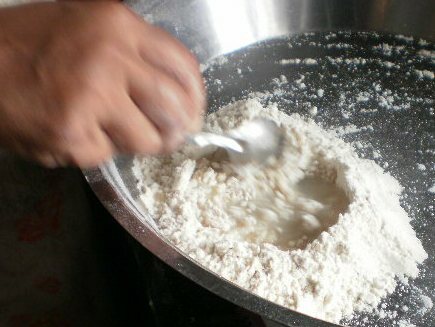 Once you have mixed it you can start using your hands to knead and add more water at room temperature if you need to add more. 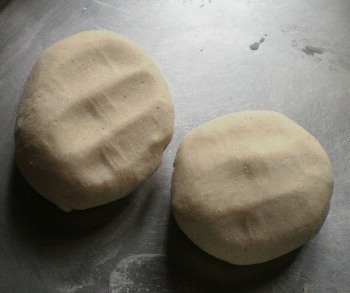 The dough will look something like this. This does not need to be kept aside for settling. 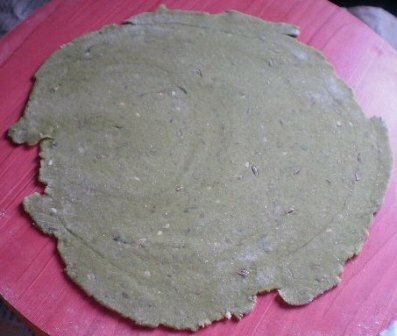 In fact, the rotis need to be made right away else you might have difficulty rolling them out later. 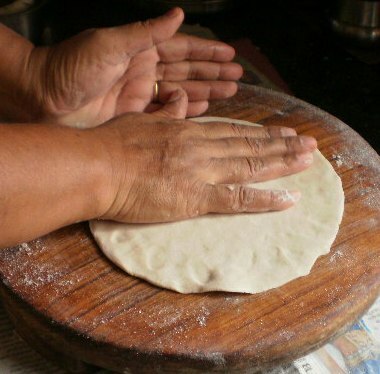 Now pinch a round big ball sized dough to prepare rotis. 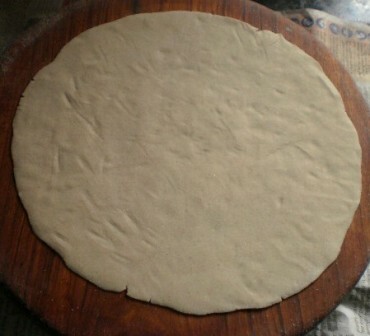 To make the roti you should press/beat the circular dough with the palm of your hand on a flat surface such as the rolling board or your kitchen platform. Initially use the right hand to beat it in the form of a circle and use the left hand to maintain a circle. Once it becomes big you can use both hands to beat it to make it thinner. You could also a rolling pin but make sure you roll it out lightly. Traditionally it is made with hands. Heat the tawa well and put the roti on the tawa. In the next few seconds, as the roti gets a little dry, use a clean muslin cloth and apply a thin layer of water on the upper surface. This can be served with any dry/gravy vegetables. 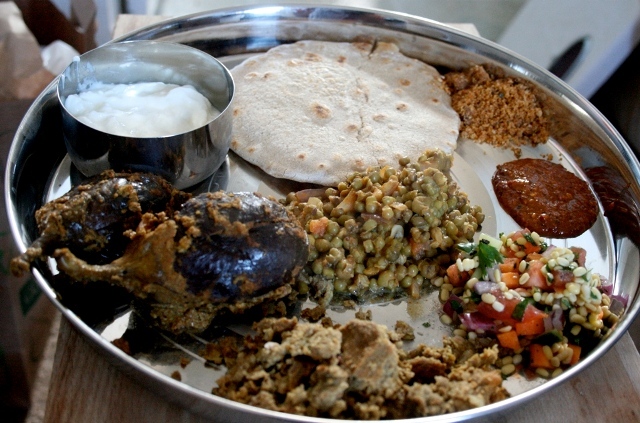 The favorite traditional combinations though are Jhunka,stuffed eggplant/brinjal,hesaru kaalu/green moong pallya, shenga hindi and kosambari. Had to take this pic from the Internet as I forgot to take a pic before serving. Very soon I will replace this with one at home. The thali shown above with rice is a complete meal. 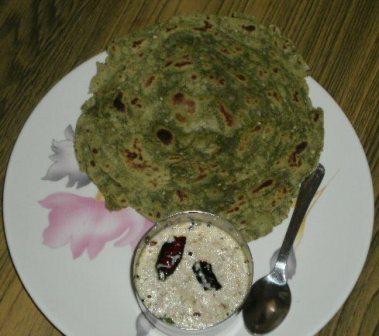 It is called as rotti meals or Joalda rotti thali here.